Logo is an important representation of your brand. An excellent logo design will not only help conveys your brand’s personality, but build customer trust and make you stand out from others as well. However, it often requires a great deal of time and money when creating a logo. Is there any way that you don’t need to spend much money and waste too much time, but create a custom logo? There are many great logo design tools online, such as logjoy and Logomakr. Recently, a brand new logo tool comes out which extends the possibilities of online logo design.DesignEvo, a new online logo maker I will introduce today. It simplifies the cumbersome process of logo design and reduces the cost a lot.The bloggers, small businesses, startups, entrepreneur and practically anyone who needs a logo design but don’t have a budget or any particular design knowledge can have it to create professional logos with no cost. The app offers millions of icons, as well as hundreds of fonts and shapes, all of which can be customized freely according to your needs. Without having to install anything and without registration, unique and professional logos can be created very quickly. To get started, enter the DesignEvo site and click Make a Logo for Free button. Once you enter the app, you will find Icon, Shape and Text panel at the left sidebar. Click Icon, and there are many popular searches displayed under the icon search panel such as the computer, Facebook, sale, and technology. And you can type a keyword in the box and then drag your preferred icon into the work canvas. Each icon can be scaled, flipped, rotated and customized with your wanted color. No matter what your business is, thanks to a large collection of vector icons you will surely find what it takes to build the identity of your brand. Text is necessary for a logo. The logo text should be clear and spiritual, which speaks volumes about your brand. In DesignEvo, there are 100+ fonts available. It’s easy to add your own company name and slogan if you have. A handy text editor enables you to edit text with your own style, color, alignment and effect. The app is simple, straightforward and easy to use. There are a lot of shapes, lines, and symbols for selection. All the elements snap automatically within the working surface so that you can arrange your logo effectively to get a perfect result. You can even change the colors, resize the canvas, change the background, manage the layers, and automatically generate a layout. Best of all, DesignEvo is free, as well as no download or registration required. You can download your logo at the end of its creation with no limit. The Preview option is quite funny, because you can see how your logo will look like on various materials such as letterhead, company wall, shirt, and business card. Download is quick and free. You will get .ZIP file which contains high-quality JPG, PNG and a PNG with transparent background. * Free web tool to design professional-looking logos. * No design skills are required. * More than one million icons. * Hundreds of fonts to choose from. * Powerful editing tools to customize your designs to your liking. * Functions of “undo” and “redo”. * Preview tool is very useful. Millions of professionally designed icons and vector shapes are provided for selection. Just drag and drop a preferred item to level up your logo. No matter what your business is (restaurant, real estate, photography studio, technology, etc. ), you will definitely find the proper options and customize them to build your brand identity. Logo text speaks volumes for your brand. There are 100+ free fonts and word arts that you can apply with one click. Choose the desired font for your logo text and customize color, size, alignment, spacing, and more to match your brand perfectly. 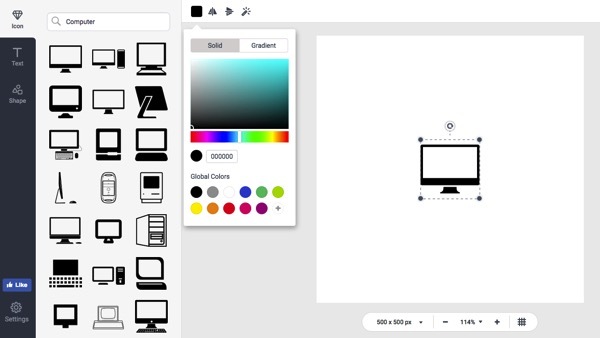 A super simple WYSIWYG editor lets you adjust icons, shapes, and texts at will. Just boost your creativity and make your own logo without limits. DesignEvo extends the possibilities of free online logo editing and personalization. It provides the simplest and fastest way for everyone to create free and professional-looking logos with only a few mouse clicks. If you need to create a logo for your new blog, website, business or any other project without spending bucks and much time, DesignEvo is a perfect fit for you. It is a free online logo maker with simple drag-and-drop system and streamlined interface which is extremely easy to use.You do not need any design skills to use it, perfect for creating a new logo or renewing the old one, especially if you do not have sufficient funds to hire a professional. It would be better if DesignEvosupports some integration with services and apps – such as cloud storage and instant messengers.